I installed MytrafficX 5.1a in my FS X (SP1) under Windows-XP and it works super. As you know MS did include the closed KaiTak airport in the FS X; I also installed an addon freeware sceney to enhance VHHX. Unfortunaltly MyTrafficX does not create any AI-traffic there. Is there any way to change that? There should not be any AI traffic on a closed airport. But, provided you have an airport layout that is capable of AI traffic, which means has parkings, taxiways, runways in FSX code ( FS9 code could do too with a few restrictions ), MyTraffic can do so. Just look into the MyTraffic editor manual how to create traffic to a new airport. When you went through this once, you will see that creating traffic into even hundreds of places with MyTraffic is a qustion of a few mouse clicks ( an some hours of computation time where you can go to bed, swimming or even to work ). Thanks; the manual is for MyTraffic2006; is this also valid for MyTrafficX?. You mean the Maual with the Q/A? I asked because I thought tht anybody has allready created AI-traffic for VHHX! just the philosophy: Traffic never is for one airport, since it always connects two of them. So the concept of "traffic for airport ICAO" is subjet to failure from first principles. What you have is a "market" of airports competing against each others for costumors - "airlines", but not in a globalized world which knows only Landmark and Pacifica, but in a very complex system of rules. Like in real life, traffic will than organize by itself according to these rules. An airport that is 747 capable and creates enough demands will see heavies, and an airport with Ramp GA only will never see them. So, what you have is a specific setup for yourself, and most likely knowbody else has exactly the same world. MyTraffic comes with rule sets, associating airlines to airports as example, and any addition of another airport will change the world around it. In this case, which airlines do you want to operate from it. These will need some of their aircraft for this airport, so cannot use them for VHHH as example. Can I export the airport database, include VHHX airport and import it again? Do I have then AI-traffic acording to the VHHX-addon AFCAD-file? No. You export YOUR entire world, including VHHX, from FSX using the Dump airports menu item from the traffic toolbox. Look for details in the manual, serach for dump airport as example. Once this is doen, you import airports.txt to the MyTraffic Editor, and this knows what you have installed. Next, in the editor you can edit VHHX, give it a name, check the country is OK, make one "Create schedules, files and traffic" , go to bed, stand up gain and there you are. - Clicked on the "Create Schedule, files, traffic"
See post #11 here http://www.flightsimworld.com/forums/inpic=134661 for the FSX scenery for VHHX. It also includes AI flightplans which fly the checkerboard approach, although they are not MyTraffic plans. Remember default FSX flies straight in approaches, which means through the mountains at VHHX. I have installed the scenery and plan on dabbling with the plans to see what happens. Any exchange airport that shall show traffic needs suitable parkings and at least one communication frequency, and if they have the above method it is hard to kill AI traffic from it. I had already added to my FSX the great Jim Vile's VHHX scenery for gates,parkings etc. If you can send me that airport, I can have a look after 5.1b release, so no hurry. Will the 51b be also for customers with the boxed version? Yes, with the typical technical delays of boxed products, which is between 8 weeks and 8 months. If Aerosoft again will host a free update for their costumors is a decision they have to take once their version is ready, which is as much in my control as in yours. since 5.1b is out, can you help me with my issue with FSX-VHHX scenery? Your procedure looks right, perhaps save, close and re-open the database in between to make sure the changes were retained? Don't forget to make a backup of the 'v.5.1b.myt' before going ahead. Please mention which operating system are you using. With Vista you'll need to set the security settings right so everything will work. Hi Jaap, I've tried again but nothing happened... I've saved a new MTX_v51b with VHHX airport set as Cathay Pacific's 2nd Hub but still no traffic. My OS is Vista: how do I have to set the security level? Here you go, to change the security settings of folders - right mouse click --> Properties --> Security --> Edit - giving your OS-user profile all the rights to write, modify and 'full control'. 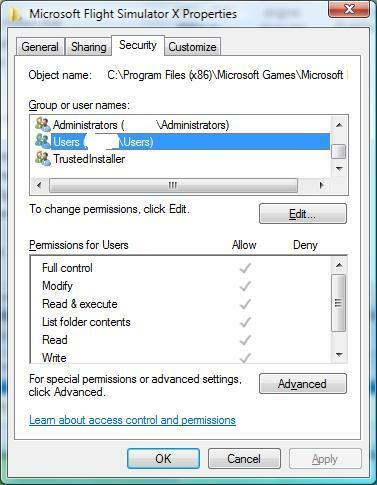 Then, do so with any program, profile or folder in which you need to be able to modify files. We recommend to do so at least for the MyTraffic folder, but if you're going to add further addons it might be a good idea to exempt the entire FSX folder from this restricted security? This assures things get overwritten when they're supposed to. Also, most of the FS related UAC warning messages will be history like this. I strongly recommend to NOT select 'Keep Both Files' with Windows Vista. ;-) It doesn't work with Vista as is. In most instances, the 'to be replaced' files become Nr2 and the old files will consequently still be used. Does the editor show, in the departures tab, schedules for VHHX? Can these be found in MyTraffic\MyCommercialRoutes.dat ? How big is the newly created MyTraffic\MyCommercialRoutes.dat ? Does the compilation produce a new MyTrafficCommercial.bgl? How big is this file? This file gets copied over to the MyTraffic\scenery folder? Than there should be traffic, if the airport is able to handle it. What do you mean Burkhard? what can I do? Sorry to barge in but is trafficdatabasebuilder in the my traffic file folder? In your last couple posts youve talked about everything but that. I am very sorry if i am wrong. I am just wondering cause it will not work if you dont have that.